Way back in the year of our Lord, 1993 (just 4 years after God gave us Taylor Swift), He (God) must have been feeling generous and bestowed upon us another Capital-G-Gift. Chipotle (NYSE: CMG). The fast-casual burrito joint out of Denver which has revolutionized the food industry. I have so much to say about Chipotle. But, for the sake of brevity, I will focus only on their new "Sofritas" option. Historically, you have always been able to order veggy/vegan at Chipotle--just don't put meat on your burrito/bowl/salad. In recent years (2014), Chipotle decided that their herbivores needed another option. Enter Sofritas. Sofritas is a portmanteau derived from the Spanish words "so" meaning "protein gelatin" and "fritas," a traditional word for disguising flavors with spices. Chipotle uses this neologism to describe their TOFU based protein. I'm not sure what the TOFU acronym stands for, but it doesn't take much imagination to guess at something that ends in FU. While I'm generally curious to try new things, there is nothing about this protein option that appealed to me enough to select it over any of Chipotle's other offerings. It is literally my last choice at the restaurant. It would be difficult to rank the meats, but they are--as a group--first place option. Second place is the regular vegetarian burrito because instead of meat you get FREE GUACAMOLE! You don't get free guac with sofritas. And sofritas doesn't taste as good as meat (more on this later). So, last place sofritas. However, a combination of marketing and curiosity got me to order a sofritas burrito. (Somewhere, people are high-fiving each other because of that sentence). You see, this past Monday there was a special offer wherein the purchase of a sofritas entree would automatically qualify you for a free entree of your choice. Just bring back your receipt showing that you were tricked into TOFU (within a month's time), and a free burrito (with meat, obvs) is yours! 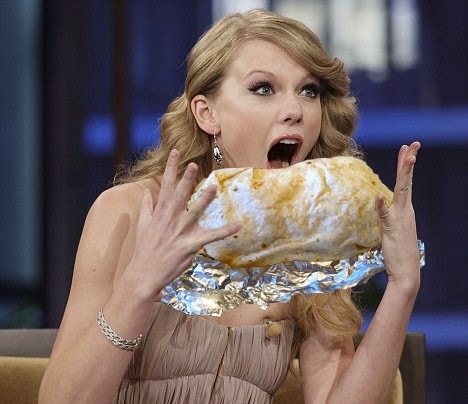 I know what you're thinking: two Chipotle burritos in one month? It's pushing the limits, I know, but sometimes in life you have to live on the edge. L-O-T-E! Hmm, not quite as good as YOLO. Anyways, I did it. And here's how it went. As a precursor to all of this, it is this author's obligation to let the reader know that Monday was a "Snow Day." Consequently, I put on clothes and left the house for the sole purpose of getting this burrito. To make myself feel more accomplished in this journey, I also returned a library book. This also meant that I had to clear the snow off of my car for this trip. Well, it had to happen sometime. At this point though, the economy of a free burrito has already been negated. I could have just bought a burrito that I wanted at a later date when I was already out doing things. Ah, the curiosity/sofritas killed the cat. There are two Chipotle restaurants proximal to my dwelling. One is better (though frequented by hordes of self-entitled high-schoolers), and one is worse (slow, problem-patrons, out of ingredients, etc) but is nearer the library. So obviously I go to the location that I know to be a worse experience because I am productive and this is an errand, not just a trip for a free burrito. As I pull into the parking lot I can already see a printer-paper sign taped to the doors telling me as-of-yet unknown bad news. They better not be out of sofritas, dammit! The good news is that the 48-pt Calibri gives no indication of lack of tofu. The bad news, no fajita ingredients (roasted peppers and onions) and no iced tea. That's a bummer. You know what goes well on a vegetarian burrito? Vegetables! I'll have to call an audible. More good news is that I beat the dinner rush. There are only four or five people in front of me. By the time I leave the line is stacked to the door in typical Chipotle fashion. Despite only being a few people, though, it is taking literally forever. Okay, not really. But I bet Chipotle Corporate has well-studied figures on ideal customer flow, and this location was not meeting those criteria. The one thing I gained from time in the line is an assurance that the BOGO sofritas deal is legit. There was no signage visible from my position, but the redneck dude 3 people in front of me asked several times to quadruple make sure that he would, in fact, get a free burrito later for his tofu sacrifice. BOGO is a go. Although I've seen the sofritas in person before I forgot what they looked like. In my mind I pictured something similar to their chicken. It's diced way smaller. In fact, the sofritas is closer to a salsa in both appearance and taste. It's easy to lose inside your mouth amidst the other ingredients. It's definitely there, though. The sofritas is not a bad taste. It is not a good taste. It is just a taste that is there. The texture is not really a problem. It is similar to the beans. The flavor is a mild Mexicany-spicy flavor. If you've had frozen burritos or tacos it is not an unfamiliar mouth experience--probably with less filler and preservatives, though. I can say definitively that barring another free-burrito-promotion or unexpected-doctor-mandated diet change, I will not order sofritas again. It is the least-good option of all of the options at Chipotle. For me. Veggy/vegans probably appreciate the effort. And I like that Chipotle is willing to experiment and add things to the menu. But, come on--meat, you guys.